Click the read More link below for another edition of the tutorial. After the solid area is of the upper is made as a base, I then make a new layer (called something like Body Shadow) and use the airbrush tool to lay in some general shadows that help give the idea of form. I do this step early so I can start to picture the shoe 3D and get a feel for where the light is coming from and overall shape and form. This is done with the same body path selected. Next, I go back to the ALL path and again use the black arrow path modifier tool to cut and paste out another panel of the upper into a new path. This one is a quarter panel. Again, I select this path, and make a new layer to paint a solid fill color into. 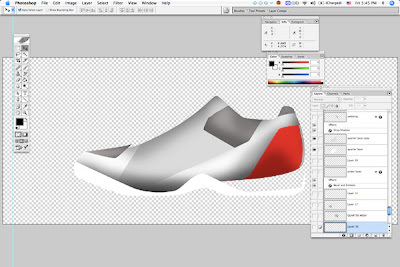 I repeat for other parts on the upper and outsole, filling in solid areas in new layers for each part. .. and one layer for shade or shadow, airbrushing black and setting the layer to Multiply. Extra detail (recessed lines, etc.) 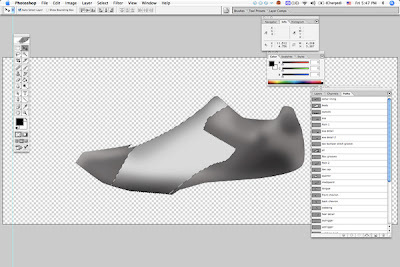 can be made by cutting and pasting line art as pixels from the illustrator drawing back into PS, then using the airbrush eraser to feather out the lines to make a dynamic shadow. 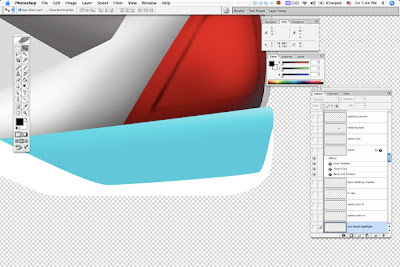 I also use the Gaussian Blue tool to slightly blur the line art I bring from illustrator to make the shadow lines less harsh. Here you can start to see some of the form taking shape in the heel, outsole and EVA midsole areas. 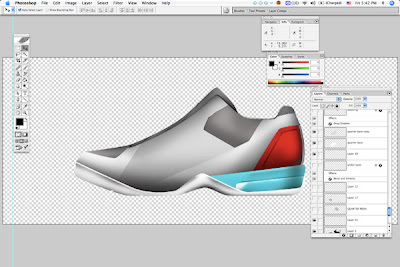 how long does it take to render a shoe model with illustrator+photoshop? The time required depends on how practiced you are at it and how much detail you want to achieve. Could be anywhere from 30min to 3+ hours. 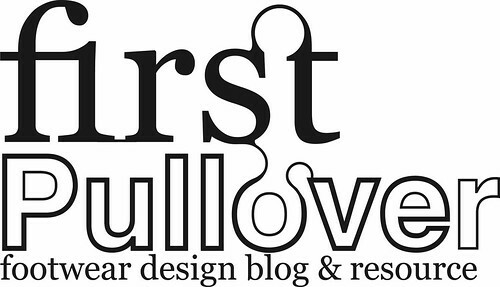 Do you have the first tutorial? This is a great help. Also, is it easier to render with a tablet or is it not necessay? Thanks. Gold 6.2 Concept FG scores!